room, and both upstairs and downstais patios. Has gorgeous views of the ocean and pool and Jacuzzi area. 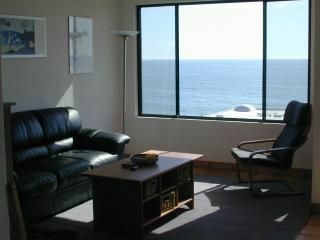 This condo is second row from ocean bluff. Has ocean view from all west windows and doors. Stayed this past weekend with my parents and overall enjoyed our stay. The owner Brigitte was very nice and responded quickly when needed. I had a few concerns but the owner responded quickly and took care of my concerns. Thank you Brigitte/owner. No AC but we knew it. Consider bringing a fan since most units in Baja dont seem to have AC. No beach access but the view from the balcony or the living area was great. Enjoyed my time and would definately stay again. Great experience for our family. Unit was as described with a great, central location and amenities. Clean, comfortable, great communication with owner. We'll definitely be back. Thank you! I loved the location of the place The high security was wonderful. They layout of the condo is great. I did NOT like the furniture, the beds are not comfortable at all, there were no dishes to cook with. There were no pans. No kitchen items whatsoever, so it made the kitchen very useless and inaccessible. All of the furniture is uncomfortable. The TV is old. The patio furniture was not comfortable at all. The beddings were old. Ants were all over the bathroom. No nice decor, it should really be updated. It also didn't really feel like the apartment was clean, like, really wiped down. Overall, it was not worth the price we paid for But it did have a spectacular view! of the oceans sunset from both verandas. Nightly Rate: $75 - $150 Weekly Rate: $100 - $500 Monthly Rate: $1500 - $1500 Rates for #4A Malaga, Plaza Del Mar, K57 Nightly - 1-2 People $75/n, 3-4 People $100/n, 5-6 People $150/n Weekly - 1-6 People $500 Monthly - 1-6 People $1500 (One time Cleaning $40) $150 security deposit, to be refunded in whole or in part after units are vacated by renters and inspected by property managaers.